HAPPY BUNCH: Members of the Meghalaya team snapped with Sunil Chetri (back row, second from left) and Sachin Tendulkar after the team's triumph on Tuesday. Meghalaya clinched the 35th sub-junior National football championship, for the Coca-Cola Cup, beating back Odisha’s spirited efforts to win by a solitary goal from Ronald Lyngdoh. The under-15 final, held on Tuesday in searing noon temperature on the artificial turf at Fr. Agnels School ground, produced its share of goalmouth action. Forty players from the tournament have been shortlisted for the u-16 National team probables by the All India Football Federation. 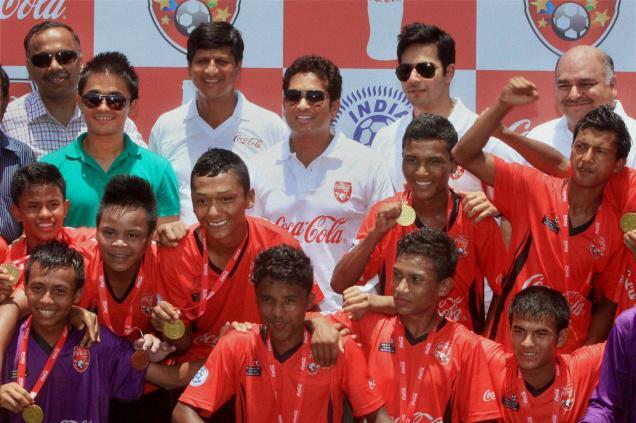 The Indian football captain Sunil Chhetri and cricket icon Sachin Tendulkar graced the final. Chhetri addressed players from the AIFF Regional Academy while Tendulkar advised the kids to inculcate a passion for the game. “I have had a lot of passion for cricket and am still mad about the game. This helped me work hard and get the right breaks,” said the legend. The Coca-Cola Cup is a tournament open to youngsters aged between 12 and 15 years. Promising talents from among the 40 shortlisted would be inducted into the various AIFF academies in the country. Robert Baan (National team technical director), Scott O’Donnell (AIFF Academies Director) and Venkatesh Kini (Sr. VP, Cola-Cola India) were also present at the final.